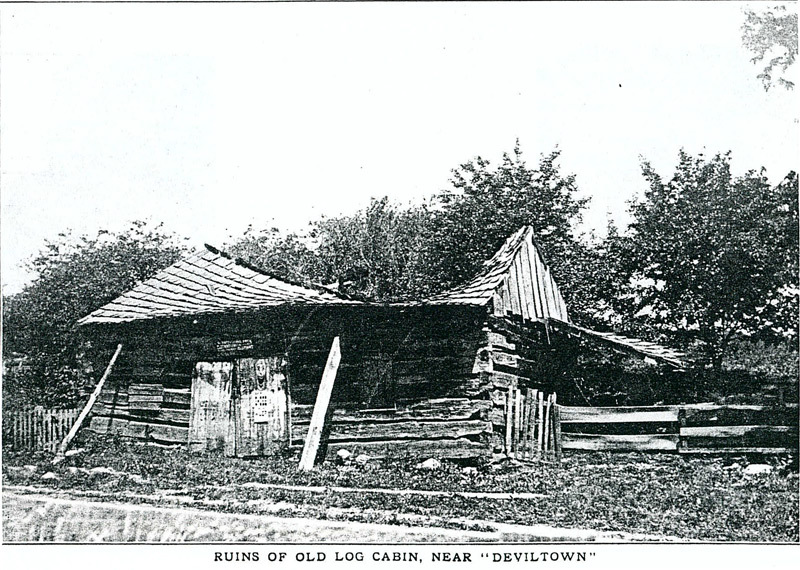 Yes, there really is a place in Wayne County called Deviltown. It’s shown on the maps as being about 5 miles north of Wooster and it’s in Wayne Township. If you follow Mechanicsburg Road (Co. Hwy. 22) out of Wooster to its intersection with Clear Creek Valley Road, you have located Deviltown. At one time it boasted a tannery, blacksmith shop, a grocery store, saloon and a post office, but now there are only about a dozen houses left to mark where those things were. The Wayne County Recorder’s Office has no record as to when the village was platted or by whom, s0 it is doubtful that we’ll ever know exactly when it began. 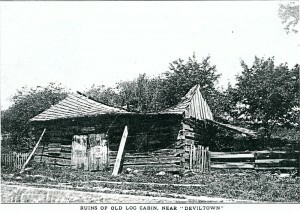 Ruins of the old log cabin near Deviltown from the book Picturesque Wayne on p.175. We know that Bernard Feazel sold land there in 1830, and that J. Miller owned land there in 1827. Names of those who owned land in that area in the 1820s and 1830s are Buchholz, Miller, Flickinger, Bucher, Mowery, Stout, Grube and others. Fridolin Buchholz was one of the first to settle here. He was born on 7 Oct 1818, the son of Johannes George Buchholz and Marie Weber, and he came to Wayne County from Germany and located in the Deviltown area in 1840. The village was first called Tannersville because Mr. Buchholz operated a tannery there, on the west side of the road near the bridge. At one time it employed as many as forty people. When the farmers killed their cattle, they took the hides to the tannery to be dyed. 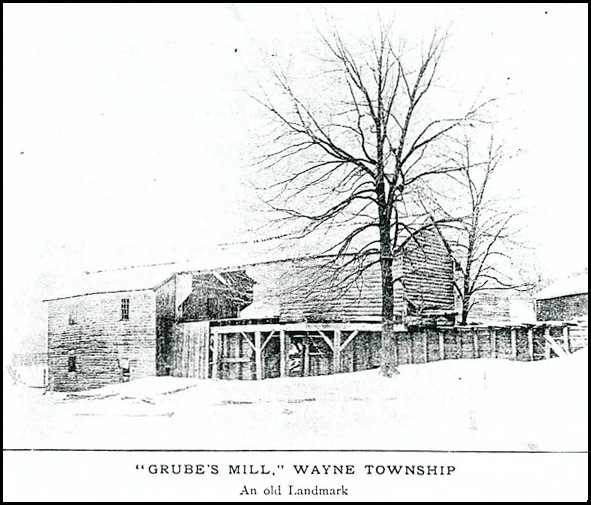 It was later moved to Wooster, to sit on North Buckeye Street up from where the old Weitzel Dry Cleaner’s was located, which is now the location of Murr Printing. There are various reasons for the name “Deviltown” and you can take your choice! One is that a man named Miller, who was rather limited in his vocabulary, was said to have used the word “Devil” so often that they named the town after this. According to another man, due to the terrible smell at the tannery from the refuse, the men needed liquid refreshments to bear the stench. Sometimes they over did it and got a little rowdy and boisterous. People called them “real Devils” and the name stuck. Mrs. Joe Ritter said maybe the name was after a real character there who always wore an old coat with a long tail resembling a modem tuxedo. His coattail would fly around in the wind, giving him the appearance of the devil. Some of the residents didn’t like the name and passed around a petition to have the name changed to Clear Creek Valley Road and the name was duly changed. That’s what the sign says today, but locals can all tell you how to get to Deviltown. The Joe Ritter home was built around 1840 and was a pioneer home of the area. Across the road from it, is the place where John Kammerline had operated his saloon and grocery store. Up the road, on the second lot north of the bridge, was the blacksmith shop used by Daniel Dull, Billy Martin, Austin Martin and Jewell Mowery. NOTE: You may see a copy of the book, Picturesque Wayne, which features many images of early buildings, houses and structures of Wayne County at the Wayne County Public Library. 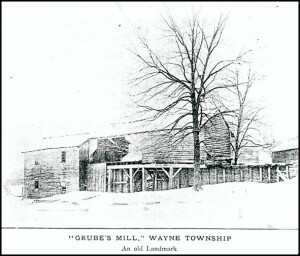 Our former home, now owned by the Ahrens family, and the barn, which we converted into a house and live in now, were part of the Stout property. There were two sisters and a brother who lived here. I believe it encompassed all four corners of CCR and Smithville Western at one time. I also remember that Jane Morris told me she and another person, whose identity I don’t recall, named our road Clear Creek Valley Road. I think Jane mentioned this in an article in The Daily Record a few years back, for which Lydia Gehring interviewed Jane and me to write a piece about Make-a-Difference Day. Many people still refer to the intersection of CCR and Mechanicsburg as Deviltown. yes, we signed the petition for the road change I believe 1978? Everytime I post something I always wondered why it came up Devil town lol! Used to creep me out a bit lol! By chance is the author of this piece, the Bonnie Knox that wrote about Pinkney Lugenbeel? I have tried to find a place to purchase her book on Major Lugenbeel, but can’t find a copy. Yes it is the same Bonnie Knox. A copy of the book has been dropped off at the Wayne County Public Library Genealogy Department and you can purchase it for $15.00. You can contact the Genealogy Dept. Librarian, Deb Kitko, to get the copy. Well, I have always heard a different story. When the tanners went out for lunch (probably to the local tavern), they came out in droves, and because they were all red from the tannen, that is why this town got the name of Deviltown. The large brick home on Mechanicsburg Road was at one time owned by Mr. Neilson. He was my boss at Fyr-Fyter in Wooster on Bowman Stree where he was the Purchasing Agent. . He was a very dear person to work for and I think of him often. Later it was owned by someone who made it into a bed and breakfast I believe. I always refer to it as Deviltown as did Mr. Neilson. i wish it was still called Devilstown. I guess it always will be to me, seems silly why people want to try to change history. I agree Larry Patterson.. Good Lord if it was not for History we would never know anything about Wayne Co.. Does that mean we can change name’s of people we did not like in Wayne Co Law or Court..? We live where the old store used to be located. Corner of Smithville-Western and Overton on the hill. need for any fuel, this is a very clean source of energy. This makes the roll-out of alternative fuels a predictable necessity in the foreseeable future.